Getting Started Writing a Book: What Do You Want to Know? 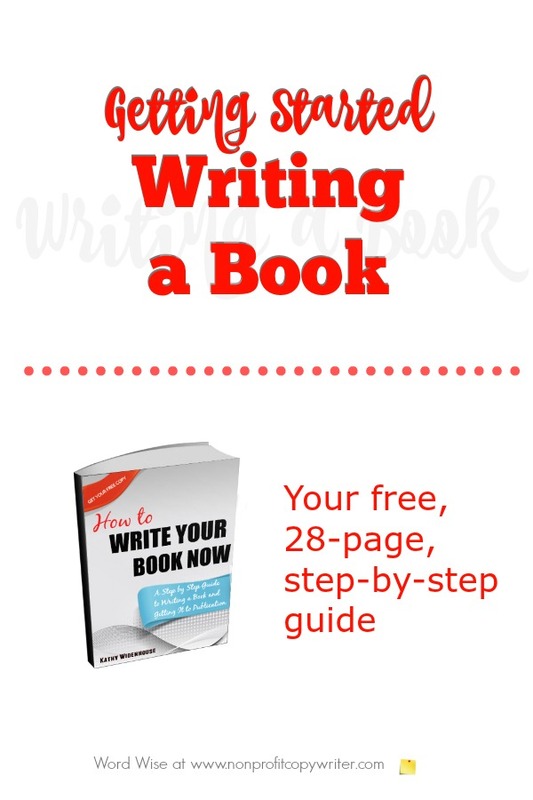 Use this free, e-book writing guide, Write Your Book Now: A Step-By-Step Guide to Writing a Book and Getting It to Publication to get started and answer all your first questions. This 28-page guide takes you through eight steps you need to take to write your book. It's a great jumpstart that I wish I'd had when I wrote my first book. When you’re done you will have a book manuscript and a plan for getting it to publication much faster than if you’d struggled through to figure it all out on your own. I think you’ll find the guide useful. And I'll also send you Word Wise. It takes about 3 or 4 minutes to read. In each issue you get practical, ready-to-use writing tips you can use right away, on any book or other writing project. The tips save you time and help you write better. And be sure to keep in touch with me on Facebook, Twitter, and Pinterest for more writing tips, too.